I don’t think I can pick just one, I appreciate it all. What is something about you that may surprise others? I think people find it surprising that I do have such a love for art; people don’t usually expect that from me. George is often the first one through the doors in the morning; he opens up the workshop every day at 5:40 and usually is among the last people to leave the floor at the end of the day. It is his admirable work ethic and his appreciation for creating top quality craft that allows him to excel in his role as Manufacturing Supervisor. After spending his early career as a logger working in his family business, George came to Thos. Moser with a love of working with his hands and a passion for learning. 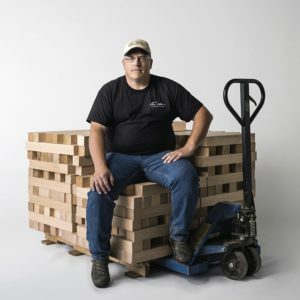 He began with little knowledge of the craft but joined the apprenticeship program and gradually worked his way through learning every concentration in the company. George has an appreciation for all forms of art. He runs a side business selling antique items of any kind. “It’s an adrenaline rush for me when I find a barn to hunt through,” he explains, “when you find something that is rare or unique it is really exciting.” One of his favorite finds being a yellow Coleman™ lantern.